Star Spangled Liberty is a 9 month program designed by Pam Buda. This beautiful row quilt measures 74 by 78. 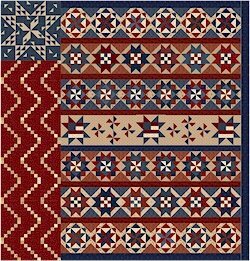 It uses the new Star Spangled Liberty by Pam Buda for Marcus Fabric. The pattern includes an additional bonus pattern to use up scraps too. If you decide the quilt needs to be on a bed additional fabrics are available for increasing its overall size, pillow cases/shams and maybe even a dust ruffle if needed. Monthly cost are just $25 each month and will get you everything you need to complete the quilt top, binding, pattern and bonus quilt pattern. Even if you are only interested please come to the call out meeting to get all your questions answered. We will have a few kits cut and ready to go for those that have already reserved their space in the class. If you can't make it to class, no problem. You may pick up your block at a later date. Just let us know you want to be a part of the program so we can have you kits ready. Looking forward to seeing you and sharing the changes that are happening here.